A campus police officer patrols the hallways as students walk the corridors of the University of Texas Rio Grande Valley May 4, 2017 in Edinburg. 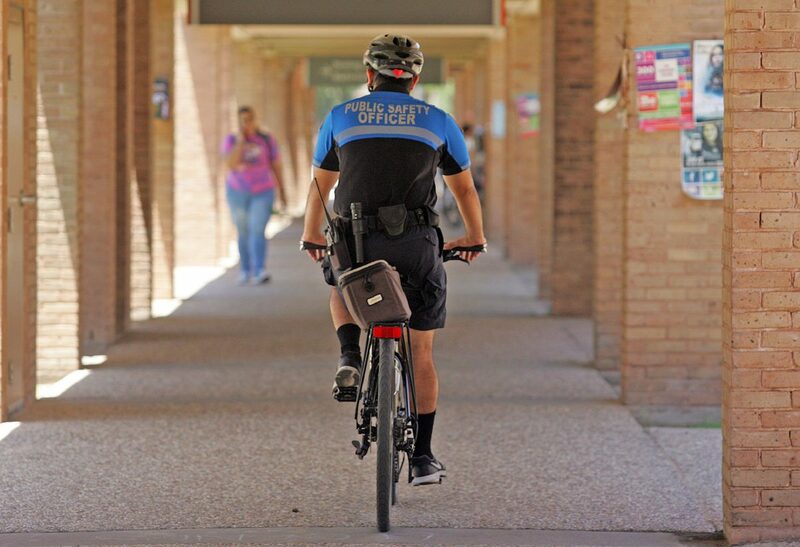 EDINBURG— After a few years filled with many transitions the University of Texas Rio Grande Valley Police Department continues to reorganize in order to fit the needs of a widespread student population. The transition involved merging the two police departments from the legacy institutions – UT- Pan American and UT-Brownsville— and months before UTRGV’s official takeover, the university hired Raul Munguia, formerly with Austin PD, as its new Police Chief. Since then, Munguia and his team have been analyzing the new needs of the university, which now covers most of the Rio Grande Valley. 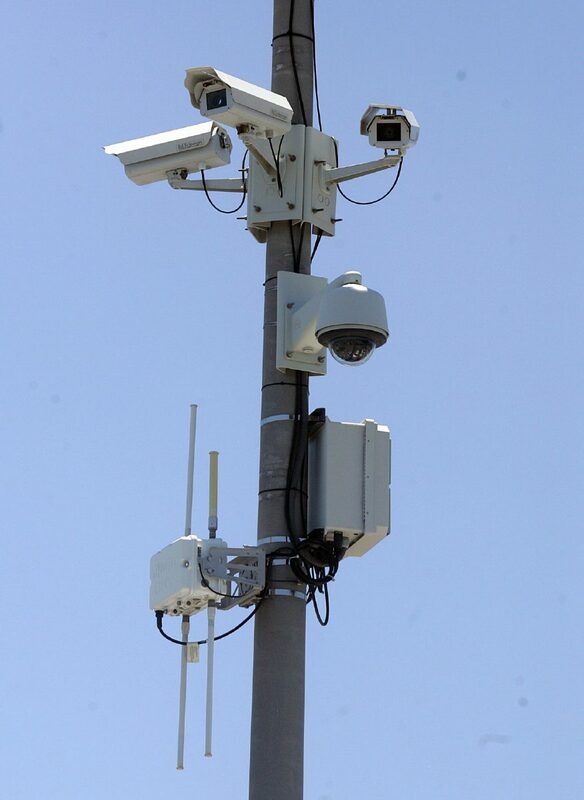 Security cameras keep a look out as students walk the corridors of the University of Texas Rio Grande Valley May 4, 2017 in Edinburg. The first part of the transition was to grow the department and restructure it to cover the campuses in Edinburg, Brownsville, Harlingen and other teaching centers such as the one in South Padre Island or Rio Grande City, he said. This also involved increasing the pay rate to attract qualified applicants, but the number of officers in service is not disclosed for security purposes. The plan is to have some of these officers trained in bike patrol in the near future in order to be more visible and swift inside the campuses, he said. Two officers will be sent to training in June to become certified trainers and in turn train the rest of the officers. The two main dispatch centers in Edinburg and Brownsville are connected so that if there is no answer in the Edinburg office, for example, the calls will transfer to Brownsville and officers can be sent out sooner to any location. But in order to reach this level of connectivity there are several technical aspects that also needed to be modified to oversee the entire region. One of the biggest challenges had been the radio system, which at first didn’t allow them to communicate amongst all the campuses and teaching sites. Last year the university invested $1.7 million in a new emergency radio system to join the regional system, Munguia said, which now allows them to communicate across campus and with other law enforcement agencies in the Valley and hospital emergency rooms. The department has also been surveying the use of the emergency phone booths called Code Blue Phones located throughout the campuses, which revealed surprisingly low use and a yet another need for change. The main reason for the lack of use is attributed to the predominant use of cell phones, which in this case allows them to explore better avenues for emergency services. One of the avenues being explored at the moment is the use of mobile applications that would allow students to report suspicious activity. “The thing was ‘Do we spend money on something not being used that’s basically obsolete?’” Munguia said. Several applications are currently being reviewed, but for Munguia the ideal application would allow students to check in when traveling alone through campus by inputting their current location and destination so that if there is any delay in arrival the campus police would be notified to contact the student. This could also be used when medicine students are expected to go out to the colonias to provide health services or any other school-related activity, he added. Having the phone application would also open up the possibility of students being able to track the location of police officers that might be responding to their call and officers tracking the student as well. This would allow students to travel to safety rather than having to wait in the vicinity of a phone booth or having to call again if they left the area. So far there have been a few promising app demonstrations, he said, with more coming in the upcoming weeks. The idea is to have something selected and fully operational by the fall along with some of the other changes such as the bike patrol. In the meantime, the most important aspect is having a fully staffed department, he said, especially in a widespread university that has multiple campuses and teaching centers. In order to do so, the university plans to perform yearly reviews of staff pay to attract and maintain qualified individuals.